Few would be surprised by the fact that fishing causes a reduction in the population of the targeted fish. That is a direct effect of fishing. But nothing in the ocean happens in a vacuum; if you decrease the number of individuals of one species, you are bound to see an effect on at least one other species, if not the entirety of the ecological community. When developing holistic management and conservation plans, it is therefore imperative that managers also consider the indirect effects of decreasing the population of a species in an ecosystem as to make the correct decisions. But how do you measure, and hence predict, these indirect effects? Imagine you are a scientist studying the effects of predators on a coral reef ecosystem. One species of reef fish has four predators: two groupers (large-bodied and large-mouthed slow-swimming fish) and two jacks (fast-moving predatory fish that hunt above reefs). You devise a series of experiments where you alter the density of each predator and measure the effect on the population of the reef fish. For example, you may remove grouper A entirely from one test reef, double the population of grouper A on a second reef and maintain it at its natural density on a third. Then you could count the number of the coral reef fish in each scenario and determine the effect of that grouper as a predator. Simple, right? Sure… if the marine system was that simple. Expand this example to include the hundreds of species and interactions in a real ecosystem, and you can imagine how quickly this individual species approach becomes extremely complicated, time-consuming and not to mention expensive. So to simplify it, you group the groupers into one group of predators and the jacks into another. A lot of the research into the effects of similar predators both on land and in the ocean has taken this simplified approach. The assumption made is that the actual identities of the predators if they are morphologically similar with a common diet and habitat (i.e. in the same ecological guild) don’t matter: they have “substitutable” effects in their ecological community. But is this really true? Would fishing out one grouper of a community have the same effect as removing the other? A manager trying to control the effects of fishing has these species-specific concerns, but scientists often unfortunately do not provide this level of detail. But these two fish aren’t similar in all aspects, especially in their feeding intensities at different ages. Nassau grouper don’t start feeding on fish until they are at least 6 inches long and only regularly when they are over 8 inches long; whereas, coney as small as 2 inches have a huge appetite for fish (Stallings 2009b). Most importantly from a management perspective though is that Nassau grouper are much larger than coney, and therefore are fished both commercially and for sport. Due to their slow breeding and the targeting of their spawning areas, Nassau grouper have been overexploited to the point of being listed as endangered on the IUCN Red List, and as Stallings (2009a) noted, their massive decline has left behind reef communities that are dominated by smaller predatory species, such as coney. In addition to their concern for the Nassau grouper, managers are now also faced with determining whether coral reef communities are threatened by having smaller-bodied predators, and hence the importance of species-specific investigations such as Stalling’s (2009b). To disentangle these groupers’ individual effects on coral reef fish recruitment and determine the possible effects of these changing communities, Stallings (2009b) experimentally altered the density of these two species across isolated standard sized patch coral reefs in the Bahamas. He caught the fish with hand-nets and relocated them, unharmed, to experimental or natural reefs far away enough that they didn’t return to their original location. A third of the reefs had only Nassau grouper, a third only coney and the last third had neither grouper (control). Over three months, the number of recruits of each coral reef fish species at each reef was counted every four days. At the end of the three months, nearly three times more fish had been recruited on the Nassau and control reefs than on the coney reefs, and the Nassau and control reefs were also significantly more diverse in the species they recruited than the coney reefs (Stallings 2009b). The cumulative recruitment of individual species for the Nassau and control reefs was significantly higher than on the coney reefs with four species in particular recruited significantly more: beaugregory damselfish, rose blenny, striped parrotfish and stoplight parrotfish. On the otherhand, the cryptic bridled and goldspot gobies saw no difference in recruitment over the three reef treatments. Clearly, Stallings (2009b) has shown that what predator dominates a coral reef community can affect the ability of larval fish to survive to recruitment. Coney create a reef community with a low abundance and a low diversity of fish recruits in comparison to a reef without predators. 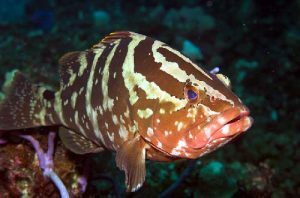 Surprisingly, no differences in recruitment were seen between the Nassau and control reefs, suggesting that Nassau grouper have no effect on recruitment, but why? Let us think back to the eating habits of our two groupers. Nassau grouper only start eating fish when they are relatively large, but coney start when they are very small. It follows that the Nassau, being larger, are also eating larger fish, and the coney, being very small, are eating even smaller fish, i.e. larval and juvenile fish. Therefore Nassau grouper don’t effect recruitment because they are not feeding on recruits, whereas the voracious coney make a significant dent in the recruitment of the fishes that are the most abundant and that it can find, which doesn’t include the camouflaged bridled and goldspot gobies. Stalling’s findings help us better understand the structure of prey communities and the importance of better defining individual predator effects, but they also highlight the need to look beyond merely the direct effects of fishing (i.e. reduced population of the targeted fish) when developing conservation and management plans. Without species-specific information, managers may make plans without properly considering the indirect effects of fishing. For example, in this case, managers may have overlooked that a decline in Nassau grouper could result in having fewer herbivorous parrotfish on a reef and therefore possibly cause an increase in macroalgal cover. Developing this level of understanding of our marine ecosystems may seem daunting, but our scientific community has the ability to do so. Overfishing is one of the greatest threats to our marine ecosystems and therefore as a society we must continue to support and encourage research into the indirect effects of fishing to ensure managers can make the correct decisions when developing a sustainable future for our oceans. Stallings CD (2009a) Fishery-independent data reveal negative effect of human population density on Caribbean predatory fish communities. PLoS One 4(5):e5333. Stallings CD (2009b) Predator identity and recruitment of coral-reef fishes: indirect effects of fishing. Mar Ecol Prog Ser 383:251-259.